Terra Loudspeakers is now shipping its Patent-Pending LS.32 outdoor LED lighting and sound reproduction system. The slim, tapered column delivers audio and highly efficient and flexible LED lighting from a totally weatherproof stealth black bollard (bollard is a lighting industry term describing short, post-like fixtures). • Learn about other outdoor speaker options from Klipsch and from Niles. 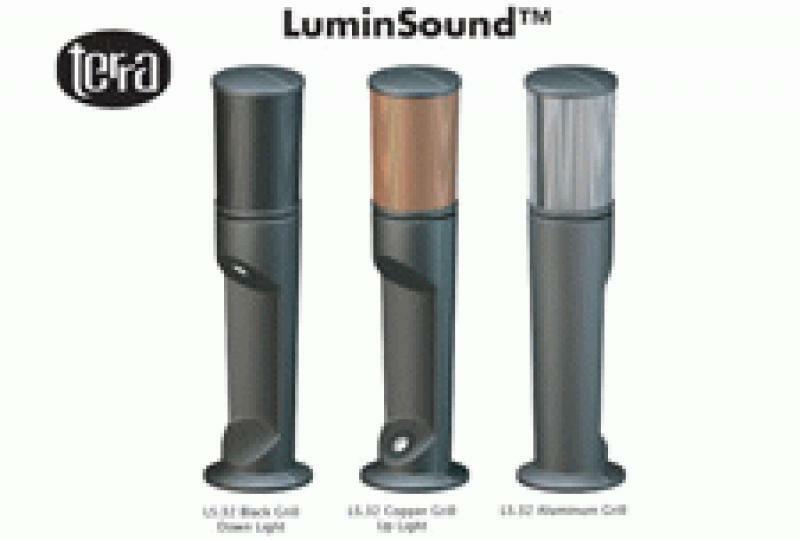 The LS.32 is a 32.5-inch high black column and may be ordered with either a down or up light installed to illuminate a pathway/patio, greenery, or other architectural elements. Optionally, both lights can be factory installed for a nominal up charge. Lighting is provided by weatherproof MR-16 LED plug-in lamps installed in cast aluminum "eyeball" adjustable fixtures. Terra's custom built 12-volt MR-16 lamps are 3-LED warm white types that output 270 lumens of beautiful, high efficiency illumination wherever it's needed. The upper third of the bollard contains a Terra-built weatherproof 5.25" co-axial loudspeaker mounted within its own housing at a 35 degree up angle to enhance sound coverage. The LS.32 can be set for 70.7 volt or 8 Ohm operation using a built-in switch located behind the grille. The speaker incorporates Terra's ACAD ceramic/alloy sandwich cone and MFCS fluid cooled spider-free technologies. Tech info on ACAD and MFCS is available at www.terraspeakers.com.